I was in search of a Natural Hair Specialist that would not only treat my hair but also listen to my personal needs as they pertain to maintaining my natural hair. I wasn't sure exactly what my hair needed, but I knew a good full-on cleansing and conditioning treatment was necessary. Throughout my consultation and appointment, Yendys and I spoke about everything from my hair products usage to to my daily food and drink intake, all to break down the dos and dont's in caring for my hair and my body, from the inside-out. Yendys is a wealth of knowledge and exudes compassion and ease with each step of the process. I'm so grateful to have stumbled across her and The Cowrie Shell Center, and I'm already looking forward to my next appointment in the near future! It's worth mentioning that you're not just paying for a hair consultation and style work; Yendys creates the most relaxing spa-like atmosphere equipped with A+ peppermint tea and soothing tunes. A wonderful addition to the FUSSY fam indeed. P.S. Her natural hair care line products are bomb.com so definitely consider investing in /trying some while at the salon! This siStar's posts and threads literally luminate peace, serenity, light,and higher vibrational themes whenever I see them. So there was no way that I could miss... recognizing my facebook friend Yendys Nefer-Atum in person. Thanks for the support of my products. Enjoy the soaps. Beverly Bolden. Here's What They're Saying About My Natural Hair Care Services and My Ancient Blends Product Line.. I have been doing my own hair for as long as I can remember and for the New Year one of my goals is to entrust my hair care with someone else. I wear my hair in its natural state. which means I prefer not to use a perm in my hair. 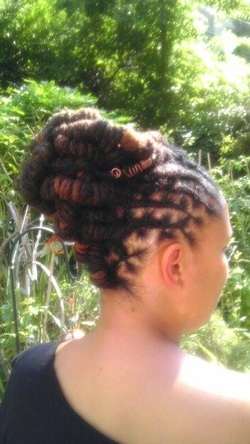 Sometimes it can be challenging to find a natural hair stylist who knows what they are doing. More importantly, for me I want to have a strong connection and a sense of trust. I think I have found someone her name is "Yendys Neferatum" Not only is she a Professional Natural hair care stylists She is also a Certified Holistic Health Practitioner. I had my first appointment with her today. I had been transitioning for 6 months and grew tired of dealing with two different hair textures. I was ready to cut off the rest of my relaxed ends but I couldn't find a stylist that would pay special attention and care for my hair. 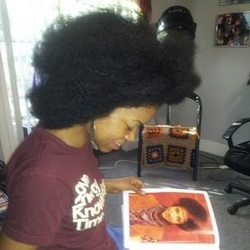 A lot of stylists are scissor happy and I discovered that some tend to be too lax on caring for natural hair. I ran into Yendys at Ny Black Expo and she explained to me all that she could do for my hair and even showed me examples of her work. I immediately booked an appountment. I went to her shop and felt so at ease. Before she got started, she explained in more detail everything she planned to do and even answered my questions and concerns. As she did my hair, she explained the ingrediants and benefits. She gave me tips on not only hair care but health in general. This was the best hair appointment I ever made and I truly believe had I done my BC elsewhere, I would've been self conscious. Yendys was very encouraging and helped me see the beauty in my hair. I definitely recommend her services and I will be returning! The gel had a nice texture, like a light pomade. It didn’t give the dry feeling that gels can give. The hair and scalp oil has Sage, Rosemary, Lavender and Lemongrass in it. I also like products that serve multiple purposes. This can be used for sealing the hair, pre-poos, hot oil treatments, etccc. It can also be used on your skin or in a bath. The herbal hair conditioner was great. Her website has detailed directions on how to make an herbal infusion with the mixture. You use it as a hair rinse. It was my first time using a an herbal hair rinse. I loved it, and I’m definitely going to use those more often. This product can also be used for a bath. The Almond Joy Body Butter smells delicious, and it didn’t leave my skin feeling too greasy. I’ve been keeping it in my bag for when I find dry spots. There are several other products on the site. I’m impressed with the ones that I tried. The Herbal Hair Conditioner and the Natural Gel were my favorites. I’m going to purchase the full size version of the gel. I’m very interested to see how it will do for a full application. 'One word does not describe it. I have never in my life purchased or sampled a line of products that I can say has changed my life. Cosmetically, mentally and spiritually, when it comes to organic products, many people will put an organic ingredient or two or a couple of extracts in for the sake of stretching a few more dollars but as soon as you open the caps of Yendys products the beautiful scents and product purity swims around you. The first product I used was the 'Almond Joy' body butter. When I opened it, I closed my eyes and felt immediate stress relief. My skin is extremely dry due to the ever changing GA climate. Besides being perfumed in a soothing almond fragrance which is very unisex, it took just one application with very little product on each part of the body. I did not moisturize again till almost night-time, the next day. The hair and scalp oil was next. I have extremely dry scalp, itching, flaking the works. I put this on my scalp for my weekly scalp massage and the flakes where literally lifted off. No itching and a feeling of soothing, cooling moisture, perfect for people who can’t use or do not like heavy oils. It is perfect for bath oil use and light body oiling. The hot oil treatments are the absolute best. It helped with getting me more hair growth and restoring my oil moisture balance. The divine spirit also instructed me to anoint myself with this oil and make holy water from it. My favorite of all the products is the herbal hair conditioner. It is a tea full of herbs and beneficial leaves. I could sit under the sink forever with this product. Not only did it soothe my scalp, it is aroma-therapy at its finest. I felt positive and was smiling like a kid with candy afterwards. The herbal conditioner can also be used to take a spiritual bath. I used it and prayed with all my heart and the spirit came to me in my sleep and told me love was on the way! The natural hair gel has no competitor! Just right, not super thick and mushy, not soupy and weak. I hate sitting under the dryer after a re-twist. The gel quickly absorbs, doesn’t dry out your natural hair moisture all while effectively holding style. Two strands and twisting is excellent with the hair gel. I did not have to sit under a dryer. All in all I enjoyed the Ancient Blends product line and I am thankful to have found them. It’s extremely hard and rare to find products this potent, pure and balanced. If you purchase them you will not regret it! '...Perry Frison Jr.